St. Anthony was born near Barcelona on December 2, 1807. He was the Son of a small woolen manufacturer. He received an elementary education, and at the age of twelve, became a weaver. He later went to Barcelona to specialize in his trade, and remained there until he was twenty. In the meantime he devoted his spare time to study and became proficient in Latin, and French. He recognized a call to religious life, and left Barcelona. He wished to become a Carthusian, but finally entered the seminary in 1829. He was ordained June 13, 1835 on the feast of St. Anthony of Padua. He started in Parish work but strongly desired missionary work, and went to Rome. He entered the Jesuit novitiate, but had to leave due to poor health. He returned to Spain, and exercised his pastoral ministry, attracting notice for his work on behalf of the poor. His superiors recalled him, and engaged his missionary work. In 1848 he was sent to the Canary Islands where he gave retreats for a year or so. On his return to Spain, he established the “Congregation of the Missionary Sons of the Immaculate Heart of Mary”, better known as the Claretians. He founded them on the feast of Our Lady of Mount Carmel, July 16, 1849. He founded the great religious library at Barcelona, which is called “Llibreria Claret”. Here several million affordable copies of the best ancient and modern Catholic works were issued. His work bore fruit, and Pope Pius IX at the request of the Spain’s Queen Isabella II appointed him Archbishop of Santiago, Cuba in 1849. He left Spain in December 1850,arriving at Cuba to being his work through reform. The Santiago seminary was reorganized, clerical discipline was strengthened, and over 9,000 marriages were validated within the first two years of his arrival. He erected a new hospital and numerous schools. His work stirred up much opposition at that time, and no fewer than 15 attempts were made on his life. In 1857, he was recalled to Spain, to become the Queens confessor. He obtained permission to resign his Cuban see, and returned to Spain, living frugally and resided in an Italian hospice. In 1869 he went to Rome to prepare for the First Vatican Council. Afterwards he retired to the Cistercian Abbey at Fontfroide, Narbonne, in southern France. He died there on October 24, 1870 at the age of 63. His life’s work both before and after his death testified to his sanctity. Pope Leo XIII declared him venerable in 1899. His relics were transferred to the mission house at Vic in 1897, and his heart was found incorrupt. Many pilgrims visit his grave, and he is one of the few saints known to have been given the privilege of literally carrying the Blessed Sacrament in his heart. Pope Pius XI beatified him 1934, and Pope Pius XII canonized him in 1950. 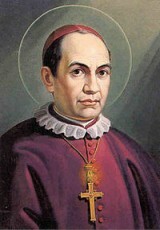 St. Anthony Mary Claret was a spiritual man at a young age. He was devoted to the Church, and received a call to the religious life. He was ordained and founded the Congregation of the Missionary Sons of the Immaculate Heart of Mary, better known as the Claretians. He had a profound compassion for the poor, and continued to assist the poor throughout his entire life. He at one point, was appointed the Archbishop of Cuba, and then returned to Spain. His heart was found incorrupt. Many pilgrims visit his grave, and he is one of the few saints known to have been given the privilege of literally carrying the Blessed Sacrament in his heart. His life shows us that one man can make a difference; by using the talents that God gives us.